Erich Osterberg and I spent the past week along the ice margin in Thule, Greenland, working with a variety of methods: lake coring, cosmogenic nuclide dating of glacial erratic boulders, and radiocarbon dating of fossil vegetation. This work will ultimately become part of my thesis, and was a great way to investigate the Thule area from a variety of angles. Our goal is to study the Holocene (the most recent ~10,000 years) climate history of Thule, and in particular a period of warm climate ~6,000 years ago (called the Holocene Climatic Optimum). 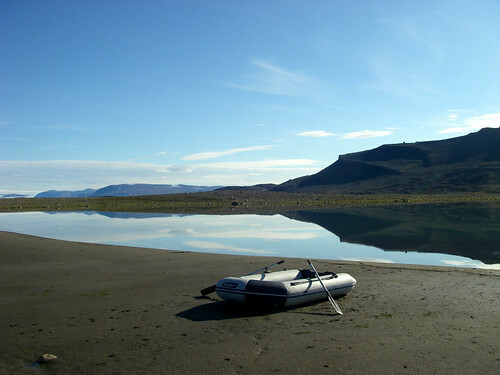 We collected sediment cores from two lakes near Thule. We can investigate various parameters within the lake sediment (for example, the amount of organic material, the size of the sediment, etc) and make inferences about climate of the past. We took cores from two very different lakes in close proximity. The first lake was fed by a large inflow, and therefore has likely experienced a high sedimentation rate throughout the Holocene; accordingly, our 1-m length corer wasn’t sufficient to reach the beginning of the sediment record. The second lake did not have an inflow, and therefore has likely experienced a low sedimentation rate. The cores we collected from this lake were very short, suggesting that the entire Holocene history of the lake is preserved in only a few tens of cm of sediment. We brought home four cores in all, and will analyze and interpret them over the coming year. Our faithful boat, “Cookie Monster”, sitting in front of the first lake we cored. To get an idea of the timing of ice margin retreat, we collected samples for cosmogenic nuclide dating in many areas across the landscape near Thule. 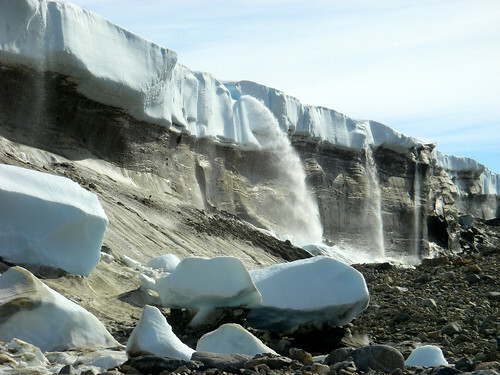 When an ice sheet retreats (like at the end of the last ice age), it drops large boulders on the landscape. As these boulders are uncovered, they become exposed to the sky and are bombarded by high-energy cosmic radiation from outside our solar system; this high energy radiation causes the formation of beryllium-10, a rare isotope that is not formed through other mechanisms on Earth’s surface. If we know the rate at which beryllium-10 is produced in rocks (only about 5 atoms per gram of quartz per year), and we can quantify the present-day abundance of beryllium-10, we can calculate the time since exposure (i.e. the time that the ice margin last retreated from this area). 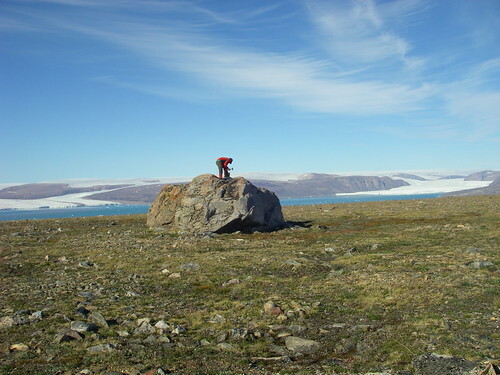 During our last week in Greenland, we sampled the tops of ~25 large boulders, spread across the land surface. We’ll use this data to determine the timing, and maybe even the rate, of ice sheet retreat at the end of the last ice age. Erich samples the top of a large boulder for beryllium-10 analysis. Finally, our third mission was to collect samples for radiocarbon dating, which allows us to determine the age of fossilized organic material. At several points during the Holocene, the climate warmed and the ice margin probably retreated upward from its present-day position. 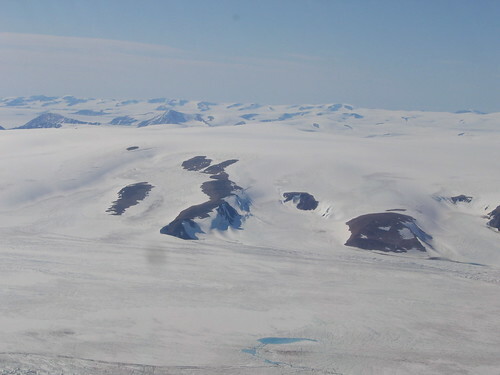 A receded ice sheet would have allowed vegetation to colonize the previously-covered areas. When climate cooled again, the ice margin would have re-advanced and covered the vegetated surface. We explored several areas of the ice sheet margin near Thule, and found fossilized organic material preserved in two locations. 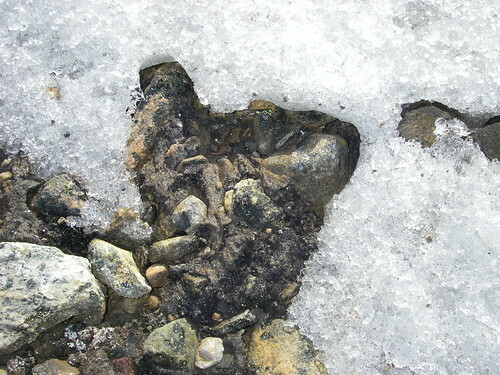 In some cases, this material was melting directly out of the ice. We’re guessing that this material may date to the Holocene Climatic Optimum or the Medieval Warm Period, and hopefully we’ll know by this fall or winter. Fossilized vegetation exposed from beneath the ice sheet margin. All in all, we had a very successful week of work along the Thule margin. We also took some time for fun. On my birthday (July 17th), Erich took me to “D-Launch”, an abandoned missile launch silo on Thule Air Base. Most of the infrastructure is underground, in the permafrost zone, and so all of the rooms are filled halfway with ice. We had to climb down ladders with headlamps to get in, and totally creeped ourselves out while we poked around. 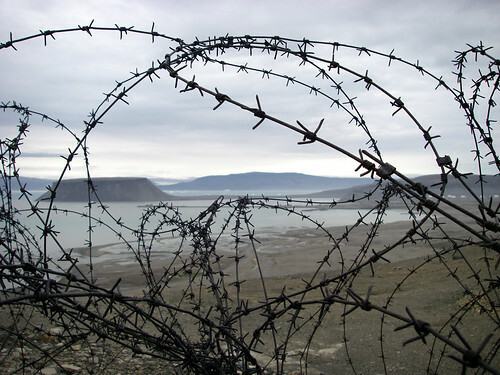 The view from D-Launch epitomizes Thule: beautiful, pristine Greenland coast with the unmistakable footprint of human warfare. 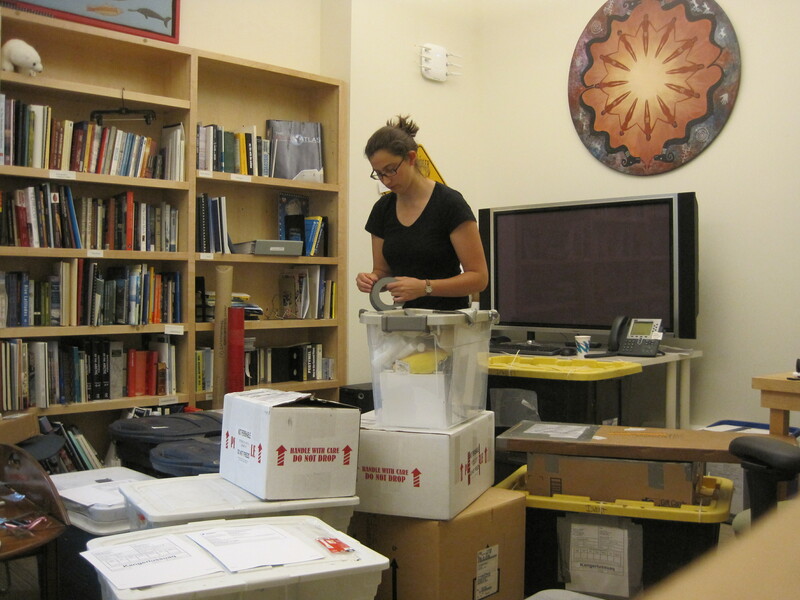 Alas, my 2011 field season has sadly come to an end. 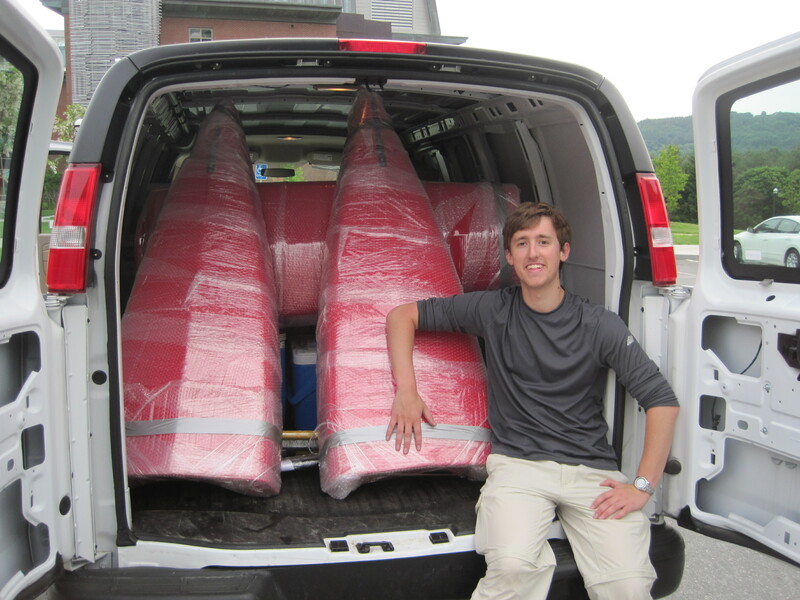 Thanks for following the progress of the Dartmouth Thule crew! We’ll continue to post updates as we get data. Day 1 (Thursday July 7): The weather on Thursday cooperated, and our ~3000 pounds of gear and the four of us made it to 76N, 63W in two helicopter flights. 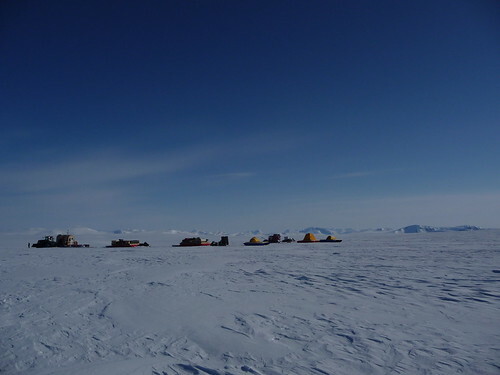 Our home for the next week was a site 80 nautical mi from Thule where ICEBridge and the Greenland Inland Traverse (GrIT) intersected. The site was a flat expanse of white as far as they eye could see: the same view in every direction, no topography, and no landmarks. It was humbling, unsettling, and beautiful. 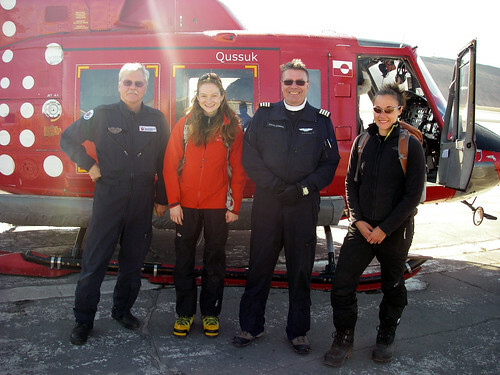 Allen (the mechanic), Ali, Stefan (the pilot), and Lee before heading off to our field site in the red helicopter! When Lee and I arrived in the second chopper flight, Eric and Erich had moved the gear from their drop-off location (500 ft overshoot) to the desired camp spot and started building a wall for our sleeping area. Because of the winds, we had to build walls out of snow blocks to protect our sleeping tents, our cooking tent and kitchen area, and our latrine. 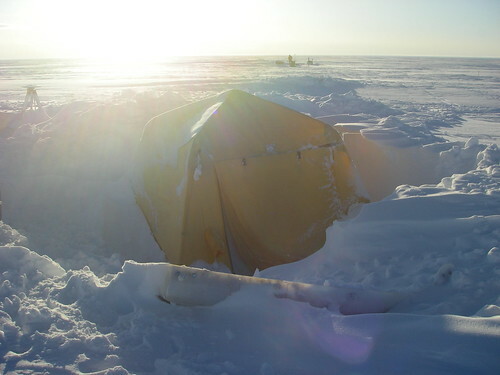 We all set up the sleeping tents, and then Eric and Lee worked on a kitchen area while Erich and I dug a latrine with the ice core. Setting up camp took most of the afternoon and evening, and over dinner we discussed the plan to dig one snow pit and do the first GPR transect the following day. Day 2 (Friday July 8): Erich and Lee dug an impressive 2 m pit in which they took measurements of snow temperature, density, conductivity (with a Finnish snowfork), bottled snow samples for chemical analysis back in Hanover, and packed cubic feet of snow into cubitainers for Fukushima Cesium detection. 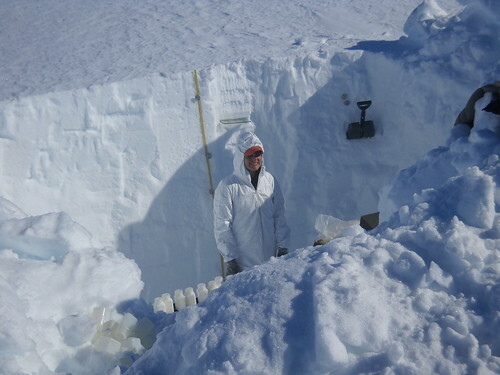 Lee taking snow pit chemistry samples in her clean suit. Eric worked on setting up the base station GPS and assembling the high-frequency GPR rover “Grover,” while I spent much of the morning entering waypoints into the arcane program on the handheld GPS by hand. Readying the GPR took much longer than expected, and Eric and I did not head out until after dinner (good thing the sun never set). We completed a 1 km traverse along an ICEBridge route, first with a straight route and then backtracking in zig zags to expand our data area. I navigated while Eric hauled both GPRs: Grover and the lower-frequency Ernie. Ali and Eric doing GPR. Days 3-4 (Saturday July 9 – Sunday July 10): The plan for Saturday was another 2 m pit adjacent to the previous day’s and a 30 m firn core drilled from the bottom of the first pit. When we woke up, it was overcast and difficult to distinguish ground from sky, but we got started with the pits and coring anyway. After a few hours, though, it became clear that the weather conditions were not going to be conducive to accomplishing much. Eric’s and my pit was filling in as we dug (so much so that in the course of taking 8 Finnish snowfork measurements, the pit filled in 10 cm). We were all getting soaked, and it was far too windy to operate the ice core. 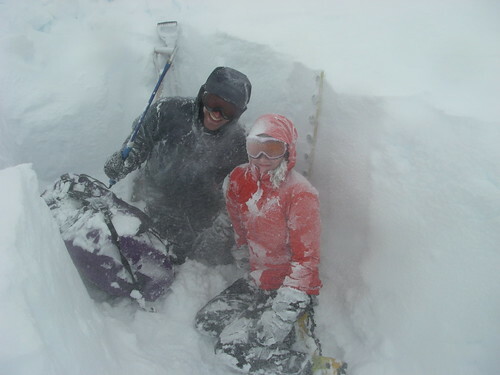 Ali and Eric trying to dig and take snow measurements during the beginning of our three-day storm. This started more than 48 hours of perpetual shoveling (the first night until 3 am) and waiting as the storm passed. 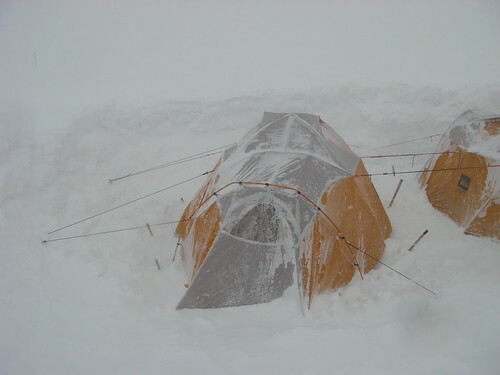 We had to dig out our tents every few hours and construct a new, higher wall upwind of camp. Ali and Lee’s tent during the storm. Our “Arctic Oven” (i.e. cook tent) in a drift. Snow built up like this about every hour or two and we had to go outside and shovel. Days 5-6 (Monday July 11 – Tuesday July 12): It was still windy on Monday, but the storm had abated somewhat. In the afternoon, we were restless, so we decided to excavate the pits we had dug (the second one was entirely filled in and the first partially filled in) to take more Fukushima/chemistry samples and also try out some near infrared photography of the pit walls. 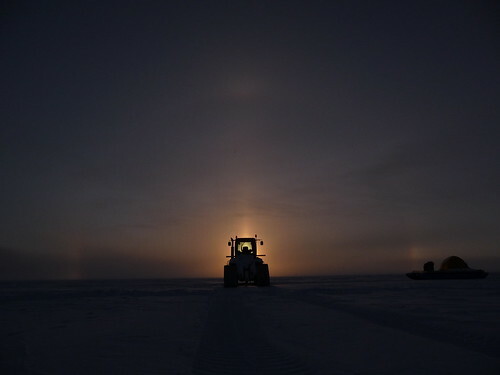 After dinner, Eric, Erich, and I decided to go out and take GPR readings along another km of the ICEBridge track and 1 km of GrIT. 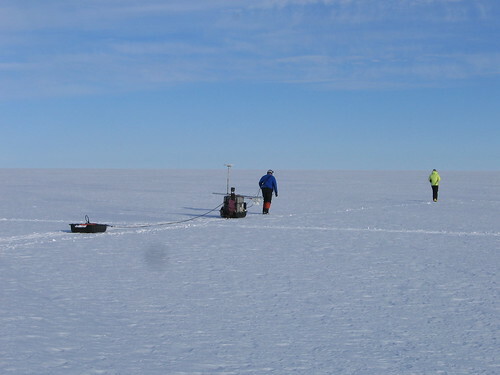 We learned how deceiving distances can appear on the ice without any landmarks; along the second GRP transect we traversed, we thought we saw a stake and a few objects nearby, presumably left by GrIT. Eric went off to explore, only to discover that the “stake” was his skis and the “objects” our tents, all the way back at camp! We had a gray sky and poor visibility when the horizon suddenly lit up. Slowly, the crack widened as the clouds lifted and the winds died. The sky starting to clear around 1 am. It was the best weather we’d had the entire time on the ice sheet and our originally scheduled Tuesday pick-up was looking likely (this was the painful irony of the weather: if the weather was good enough to accomplish our scientific pursuits, it was also good enough to fly, so the helicopter would be coming!). We thought we had about 10 hours until a potential pick-up and decided to get started on drilling the firn core, which was the post important of our scientific objectives. Since our generator had died in the storm, we no longer had the option of powered drilling. Erich sensed it was possible to get to ~20 m by hand, so we woke up Lee, had breakfast #1 around 2:30 am, and got the core barrels ready. At 4:23 am, Erich and Eric started drilling while Lee and I logged the core. The core came out in pieces ~70 cm long (each extraction is called a “run”); towards the surface, each run separated into several chunks. Lee and I measured the pieces, recorded the ice layers, and bagged and labeled the core. 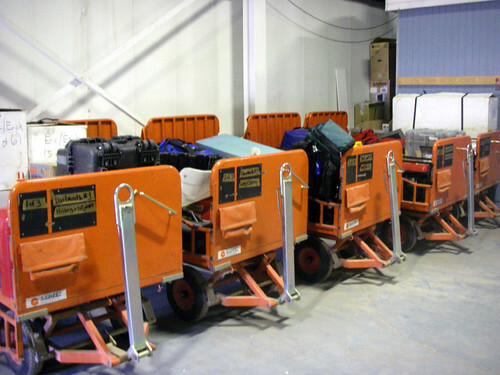 9 bags fit into an insulated box, which had to be buried to keep the firn from melting. 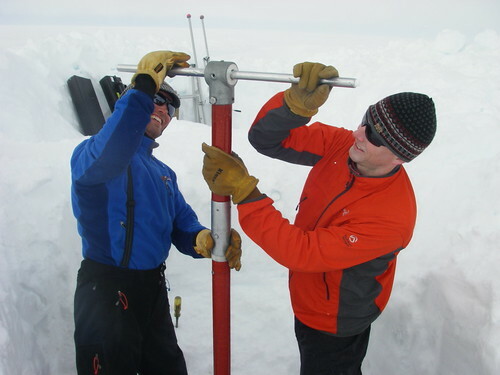 When the core reaches Thule, it will stay in a freezer until a flight with a “cold deck” goes back to the States. Eric and Erich drilling the firn core by hand! 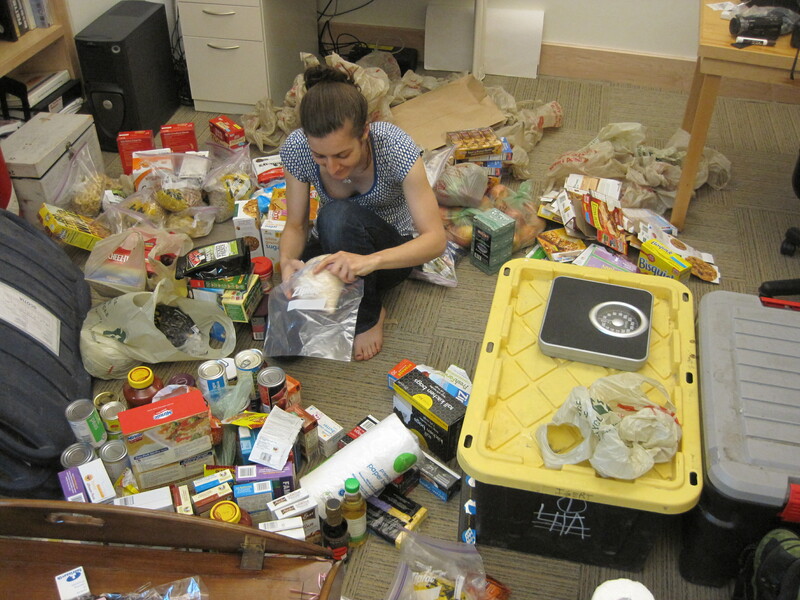 We worked straight through until 7:30 am, when we had reached 11 m, and then had breakfast #2. We called Air Greenland to get the disappointing news that the weather there wasn’t looking promising for a take-off. We were told to call back at 12:30 and, in the meantime, organized gear in case we would need to leave later that day. But at mid-day the winds in Thule were strong (we later found out 65 knots! ), so we knew we wouldn’t be leaving until Thursday at least. We all crashed and napped/relaxed for the rest of the day. Day 7 (Wednesday July 13): Because we knew we wouldn’t be leaving Wednesday, we had a leisurely brunch of pancakes and then spent the rest of the day finishing the core, this time with a longer core barrel that could extract over a meter each run. We reached just over 20 m, at which point the firn was so dense/brittle that it was difficult to drill and nearly impossible to extract from the core barrel. It was overcast, windy, and snowing yet again, and we were worried about our prospects of getting out on Thursday. Lee and Erich are sticking around for an extra week to do work around the margin area, but Eric and I were scheduled to leave on Friday the 15th and needed to make it back to catch our flight (though, to be honest, I wouldn’t have been too disappointed to have had an excuse to stay). Day 8 (Thursday July 14): We woke up to beautiful blue skies and were optimistic about our flying chances. After sorting out some confusion with Air Greenland, whose personnel had changed during the course of our time on the ice, we found out we’d get on flight out on Thursday and then another the next day, weather permitting. 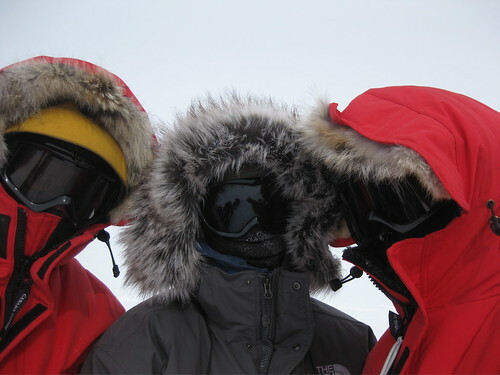 Lee brilliantly suggested that we shift around gear/weights so that all 4 people could make it back to Thule together. We had an hour and a half of warning before the helicopter arrived, during which Eric was in the pit taking near-IR pictures of the pit stratigraphy and Erich, Lee, and I frantically packed, dug out the tent stakes (no easy task as some were buried below feet of ice and wind-packed snow), and made a cache of gear for pick-up the following day. We arrived back in Thule by 1:30, sorted/dried gear, took snow samples to the freezer, and showered for the first time in a week! We had a great night catching up with the other Thule “beakers” and then headed to bed. View of nunataks, supraglacial lakes, and crevasses from the helicopter. 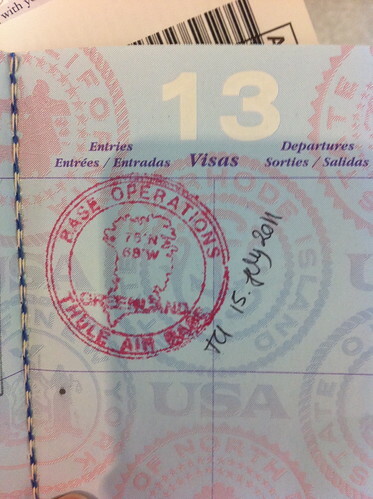 Friday July 15: Eric and I woke up at 5 am to check in for our DC-8 flight and had just enough time to meet Lee and Erich for breakfast before they headed to catch the helicopter back to the ice to recover the rest of our gear. We saw the helicopter take off just as we were boarding our plane to Baltimore! With the news that we couldn’t fly on Tuesday or Wednesday, we decided to get some science done! After waiting around the Air Greenland hanger for 5 hours on Tuesday morning, we spent the afternoon in the warehouse testing and organizing gear for Lee’s work around the ice margin. 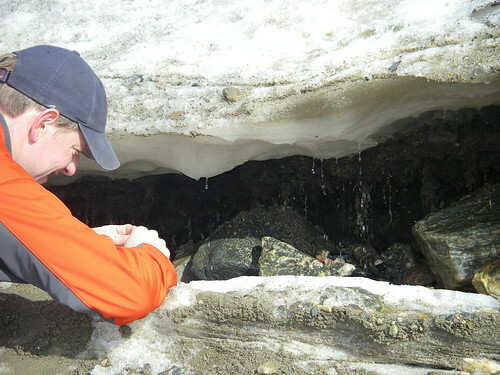 Lee is interested in studying the history of the ice sheet margin over the past 10,000 years and the climate changes that occurred during that time period. We woke up bright and early and, armed with our new mosquito nets and 98% deet bug spray, hiked to the margin of the Greenland Ice Sheet. We were all excited as it was the first time any of us had set foot on this great body of ice. Additionally, Eric spotted a plethora of roots protruding from a recently exposed shelf of ice. We collected some of these roots and examined vegetation on the ground, as well. Erich checking out the vegetation at the margin. Lee will run carbon tests to determine the age of the vegetation trapped in the ice and, thus, piece together part of the ice history on the margin. 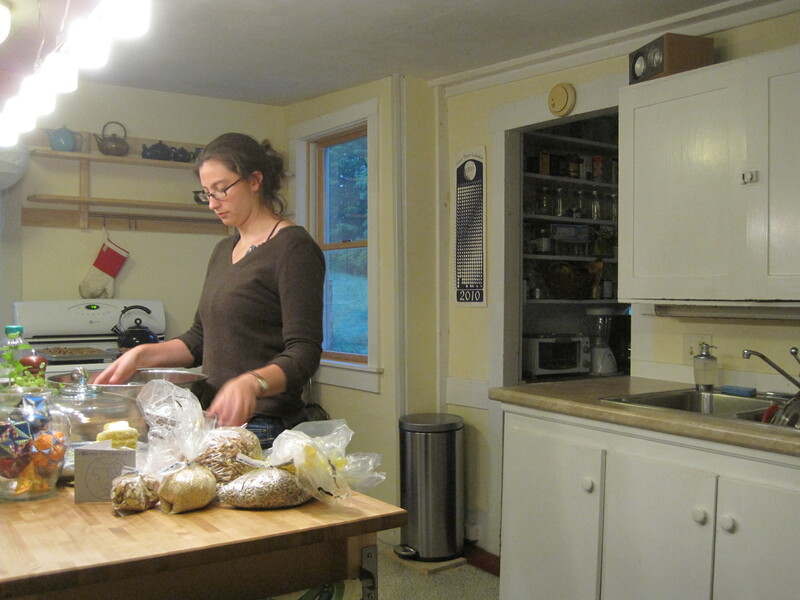 She also collected a few rocks for cosmogenic nuclide analysis, which also constrains age. After stopping for lunch near waterfalls, we hiked back to the truck and set off on to check out some lakes that Lee is interested in coring. 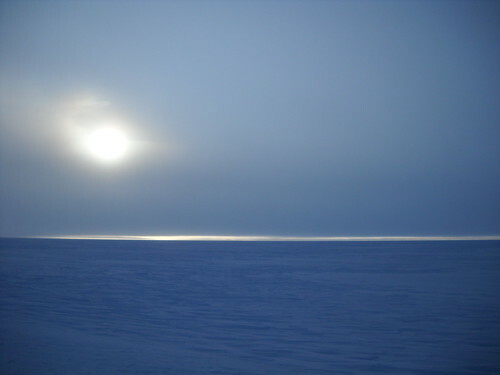 The edge of the Greenland Ice Sheet. A basic map of Thule AB and the surrounding area was all we had to navigate, but, after a few wrong turns, we were confident we were on the road to the fjord with two large lakes. However, we were stopped by large barrels in the middle of the road and instead took a long, circuitous route under power lines (only to discover later that the road with the barrels was, indeed, passable and we probably could have saved the hour or two we spend bumping down the poorly maintained dirt road with high voltage warning signs). The lakes did, indeed, seem ideal for Lee’s work, and she and Erich planned some logistics and scoped out some areas for rock samples, as well. After checking out the lakes (and panicking briefly when the truck was stuck in mud miles from base), we scrambled down to the coast where we waded in the Arctic Ocean, rode icebergs (yes, literally), and spotted a few seals! 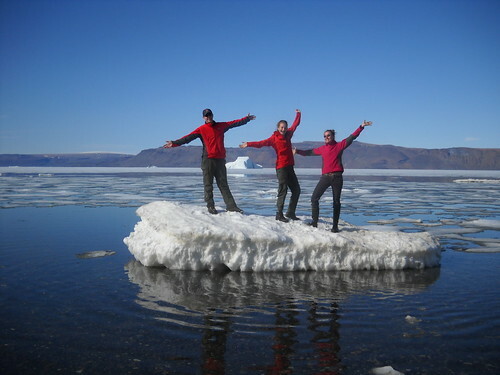 Playing on an iceberg in the fjord near Thule. We thought we’d had all of our excitement for the day when we were sitting down for dinner at the base dining hall, but then we were informed that we were in lockdown because a polar bear and her two cubs had wandered onto base! Apparently, this happens only rarely, but the protocol is to lure the bears away from base or, if they don’t leave and get aggressive, shoot them. Fortunately, these bears had the good sense to leave quickly, but their presence worried us since we had been informed that bears wouldn’t be an issue in the Thule region in July. Eric and Erich spent the evening procuring a gun for our time on the ice, just in case a polar bear happens to walk into our camp there! Hello from Thule. Wait, why are we in Thule?? I thought we were supposed to be up on the ice? Yes, it’s true, we’re still in Thule. We showed up at the Air Greenland hanger bright and early yesterday morning, ready to go for a week up on the ice sheet, only to be met with high winds that prevented us from flying. The winds along the ice sheet margin were around 40 knots, and the pilot suspected up to 50 knots over the ice. Winds make helicopter flying difficult in general, but they’re an especially big problem for us since we’ll be carrying so much cargo and the helicopter will be so heavy. In fact, according to the pilot’s calculations, we’ll only have three minutes (yes, that’s three (3) minutes!!) worth of extra fuel, assuming ideal conditions. And unfortunately, today’s weather was far from ideal, so it seems like we’re grounded until the morning of the 7th. Fortunately, we have plenty to keep busy with around Thule. We’re planning on doing some work around the ice margin today, including looking for organic matter protruding from the ice sheet (for radiocarbon dating), and collecting some bedrock and boulder samples for cosmogenic nuclide dating. It should be a fun day for driving around in the truck and exploring. 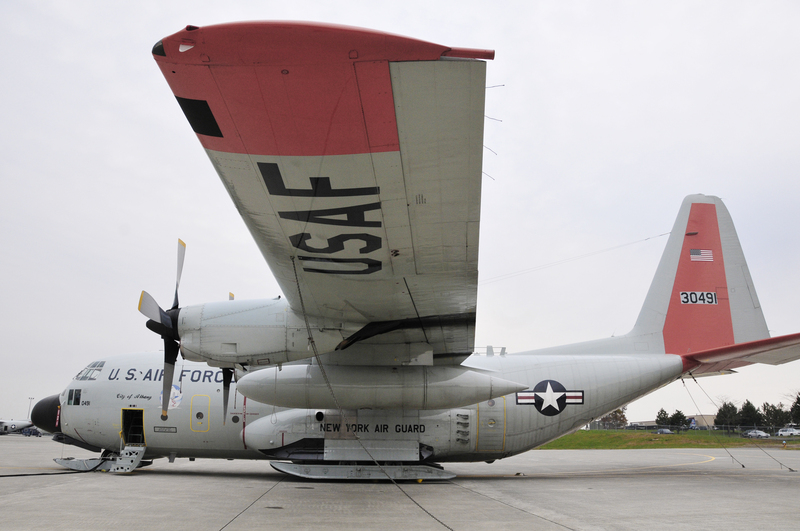 Hopefully we’ll fly out to the ice on the morning of the 7th… keep your fingers crossed for sunny skies and calm winds!